As a Love Lula blogger, I receive their gorgeous natural beauty box every month. I always look forward to seeing what treats are inside and this month, I was especially pleased as I love all of the products. In fact, I already use some of them and was needing a top up. So it’s the perfect natural beauty box for me. What’s Inside October’s Love Lula Natural Beauty Box? 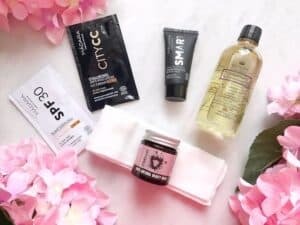 This month’s natural beauty box contains Madara Charcoal & Mud Repair Mask, Lyonsleaf Beauty Balm and Muslin Face Cloth, Kathleen Natural Body & Massage Oil and samples of Madara SPF30 Facial Sunscreen and City CC Cream. This month’s natural beauty box is worth £54, and comes with a voucher code for 20% off each brand in the box. Kathleen Natural Tranquil Fields Body and Massage Oil I’ll start with a product that’s totally new to me: Kathleen Natural Tranquil Fields Body and Massage Oil, worth £34*. This blend of 100% natural oils is 97% organic and vegan-friendly. It has notes of lavender, frankincense and vanilla and as you can imagine, smells gorgeous. I love it, and it’s helping me relax, as it smoothes my skin. The glass bottle comes in a cardboard box, so it will be easy to recycle when I’ve finished it. It’s also made in the UK. Madara Smart Anti-Pollution Charcoal & Mud Repair Mask Another new product to me is Madara Smart Anti-Pollution Charcoal & Mud Repair Mask, which is worth £24*. Although I’ve never used this mask before, I have used loads of Madara products and have loved every one of them. This mask is no exception. This black mask contains antioxidant-rich black northern mud and charcoal to purify and promote skin cell renewal. It’s lovely to use and makes skin look more radiant. Madara Samples Along with the full-sized Madara face mask, there are some samples of their SPF30 Face Sunscreen and Anti-Pollution CC Cream. I already have the full sized versions of both of these and know they are great. The CC Cream in particular is fantastic – it covers so well and is a great match for my pale skin, but comes in a darker shade too. You can read my full review of Madara CC Cream here. I also really like the Age-Defying Face Sunscreen and took the full size with me on a recent trip to a very hot Nashville. You can read my review of this sunscreen and other natural sunscreens on this post. Lyonsleaf Beauty Balm and Muslin Cloth The final products in this month’s natural Beauty Box from Love Lula are a travel sized version of Lyonsleaf Beauty Balm and a muslin cloth to remove it. I’ve been using a full sized version of this for ages now and love it. It’s great for removing make-up and leaves skin feeling fab. The full size of this 100% natural beauty balm is £12.95* and lasts for ages. I massage a little over my eyelashes and use a damp cotton pad to wipe the excess away. Next I apply more balm over my whole face, and massage it in. I remove it with a muslin cloth soaked in hot water, and follow this with a sweep of micellar water. I was worried it might give me spots as it’s so rich, but it doesn’t. There’s no greasy residue and it really gets skin clean. Natural Beauty Box Details The Love Lula natural Beauty box costs £13.95 a month* when you sign up on the recurring plan. The value of each box is at least £50 and often more. You also get 20% off each of the brands in the box for the rest of the month.